When Michael Pafford, M.D., served on a committee to decide whether Saline Memorial Hospital should join Arkansas SAVES, he had no idea how profoundly that decision would affect him several years later. 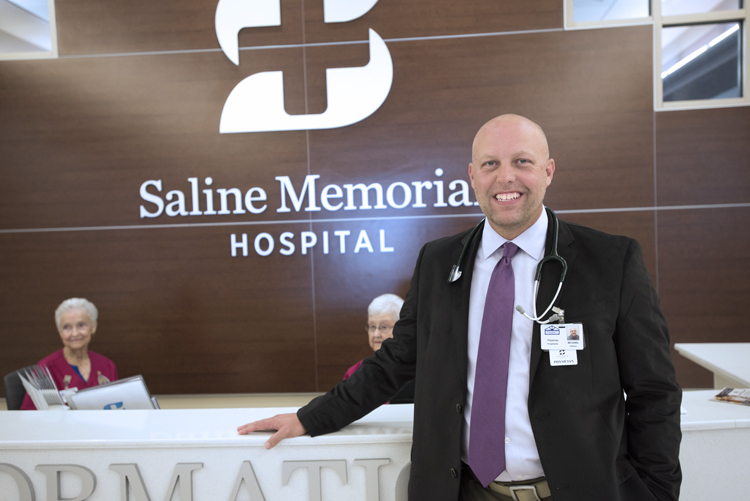 Saline Memorial Hospital, where Pafford serves as a hospitalist and medical director of inpatient specialty, chose to join the telemedicine stroke network. Pafford is very glad it did because on the morning on March 23 he was wheeled into the Emergency Department in need of a consult with a AR SAVES stroke neurologist. He had the morning off work, and the day had begun normally enough at his home in Benton. Pafford had gone through some of his morning routine but interrupted his watching of a sports news broadcast to kiss his wife. It was then that he started to feel nauseous and sweat profusely. When he tried to make his way to the bathroom, he had trouble walking and balancing himself. Although his wife wanted to call an ambulance, the Pafford home is only eight minutes away from the hospital, so he insisted his wife drive him there to save precious minutes. Already, he strongly suspected he was having a stroke. “Time is brain, is what I was thinking, so I said, ‘No, no, no, get me to the car,’” Pafford said. His knowledge of Saline Memorial Hospital, especially about where to go and to whom he should talk, greatly sped up the process. The doctors consulted via real-time video with Margaret Tremwel, M.D., a Washington Regional Medical Center stroke neurologist in the AR SAVES network. She advised they administer the powerful clot-busting blood thinner alteplase. Pafford received the blood thinner less than 45 minutes after he began experiencing symptoms. By the time he was transferred to UAMS shortly after treatment, the nausea was diminishing and his voice, which also had been affected by the stroke, was much improved. Pafford spent two days at UAMS Medical Center undergoing observation and testing. After discharge, he had three sessions of outpatient physical therapy and had to use a cane for about two weeks, but within a short time he found himself virtually free of stroke symptoms or health problems the stroke may have caused. Just three months before Saline Memorial decided to join the AR SAVES network, Pafford had attended a conference in Dallas and learned about the telemedicine stroke network in Texas. He hadn’t realized that Arkansas had its own telemedicine stroke program.